The funniest kid in fiction is back! Follow his life’s ups and downs told through laugh-out-loud letters, emails, texts and more! This is the first time I have read a book that is entirely constructed using emails, texts, forum discussions and letters. I admit I was a little skeptical at first, as I have always tended to go for the more traditional regular chapter books ( I’m guessing that’s more to do with the fact that emails, texts and forums did not exist when I was a teen). However, I was pleasantly surprised by how easy it was to get into the swing with this style and how using fragments of writing actually still maintained the flow of the story. 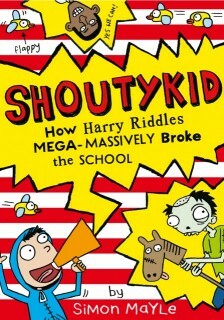 As I mentioned, ShoutyKid is a collection of emails, texts and letters written by 10 year old Harry. The reader is drawn into his world through reading his private and personal correspondence. It is cleverly arranged to give the reader variety and through the linking theme, manages to create a story without actually being written in story style. Because it is written in first person style, we can really identify with Harry and he begins to feel like someone you actually know. It was almost as if I was given access to his dairy, his email and his mobile phone. A little naughty, like sneaking a peek where I shouldn’t. Harry is not your typical 10 year old and truly believes that to make things happen, you just need to ask the right people. He bravely writes to celebrities, royals and regular people to help him fulfill his dreams and desires. He is refreshingly innocent and hopeful in the tone he writes in and you find yourself wishing that for his sake, some of his requests are granted. My mum said if there’s one player in the whole of England who could help turn me and my school team from a bunch of losers into the best team in the South-West, it would be you. I told my mum that’s not going to happen because you don’t live in Cornwall, but my mum said you LOVE Cornwall. So that gave me a great idea!! Why don’t you move your family down here and live your CORNISH DREAM?!! Then you could send your kids to MY school. I think Cruz is about my age, and if he’s anything like you, I can tell Mr Phillips we have some real talent on the way and maybe – JUST MAYBE – we won’t get CRUSHED in the first round of the cup. That’s all I have to say. Good luck and have fun and GBTM soon! His correspondence is endearing, cute, funny and occasionally silly, as are the responses he gets from some of the people he writes to. He has an online relationship with his cousin who is in the US and who often tries to give Harry a reality check, which Harry adeptly seems to gloss over and ignore. Many of the adults are very polite in their responses and it is amusing to read his reactions to their responses. As with children in this age group, referencing electronic gadgets, games and using these mediums is very relevant. My daughter has recently started playing games which have chat forums and so understood and enjoyed it when Harry was chatting in his Zombie forum. If you like Dairy of a wimpy kid, then you’ll like this. I liked how it is set out in emails, letters, and texts rather than normal paragrpahs we read everyday. It is basically the story of the life of an average 10 year-old boy about moving schools, coping with big sisters and parents and sometimes girls. 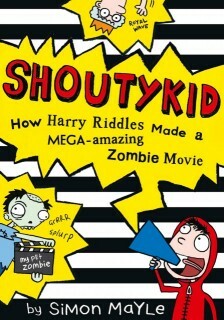 I recommend this book to anyone age 9+ and those who love a good laugh. 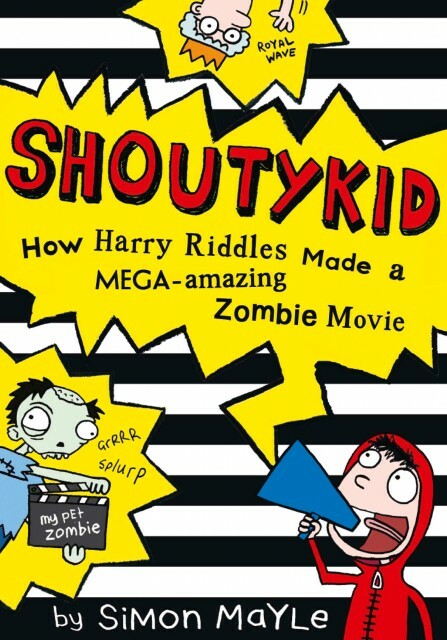 Both Simon Mayle’s Shouty Kid books; How Harry Riddles made a Mega-Amazing Zombie Movie and How Harry Riddles Mega Massively broke the school are great reads. I rate them 5 stars! 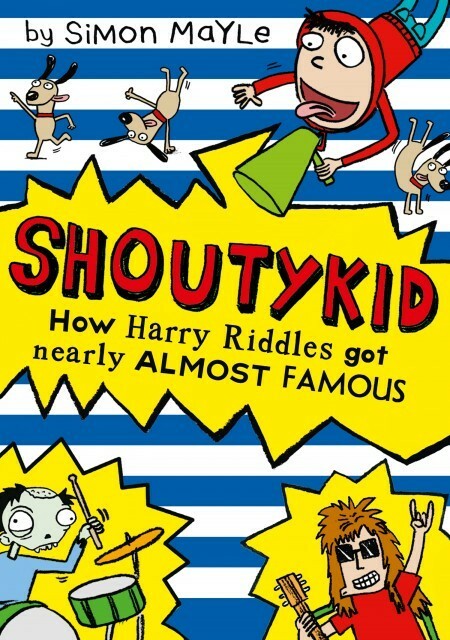 Lookout for the 3rd ShoutyKid book in August 2015! Purchase your own copy of Shoutykid today!